acoustic incidents of a room were recorded with a basic cassette recorder. there are two automatic working rhythm devices in the room. these machines create very gentle noises that modify themselves in a period of hours. otherwise there is no acoustic scenery in the record room. after a while the listener gets the feeling he could feel for the room in an acoustic way, similar to acclimate eyes to a very dark room. beside the rhythmic ticktack there are just noises that are nearly inaudible. there’s no possibility to identify or to categorise the noises. it doesn’t matter if the listener hears the noises in a concentrated or relaxed way, a kind of hypnotic state gets to him. senses were sensitised to the music and it’s possible to perceive the scenery that is outside the room. these are just the facts of live that were recorded at random. the cassettes which were used are old 120s BASF LH (the orange ones). knowingly there is no noise suppression or filtering, the character of the old cassette is a stylistic device as well. 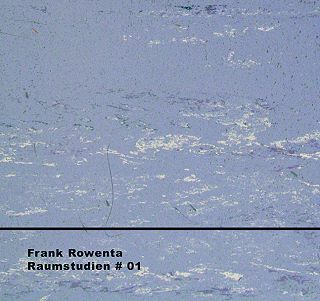 01 VITAL WEEKLY | number 562 – week 5 | "Raumstudien # 01"
02 CD Feature/ Frank Rowenta: "Raumstudien # 01"
Recording Rooms: Experimental music of the most extreme kind that works on more than just a cerebral level. 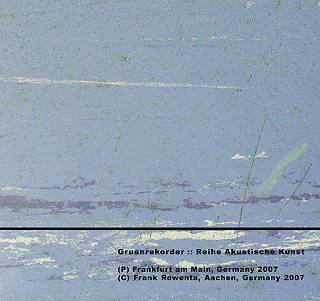 I could well imagine that if a public speaker were looking for a good example of what constitutes "l’art pour l’art" (art for art’s sake) he would treat his audience to a couple of minutes of "Raumstudien # 01". Even in the "enlightened" times we live in one can already see listeners from all generations and social backgrounds looking down on this album as the typical excrescences of the experimental music scene, as one of those elitist records that critics will praise without understanding their meaning. And yet, my feelings towards it are simple and void of any intellectual mindgames: I love it and highly recommend it as a work which may go to extremes but only does so to achieve something special: In a world flooded with artists trying to sound like someone else, this record sticks out. The basic setting already points at the radical nature of Rowenta’s concept: An old analogue tape recorder is placed inside an empty room, containing a vintage orange BASF cassette. Two rhythm devices of no further specification are placed in relative proximity of the tape recorder, their subtle impulses subject to delicate modifications in a multi-hour cycle. The noise emited by the devices can be described as a mixture of a feeble child clapping his hands and the sounds of a metronome on valium. Sometimes, they will be slightly louder, sometimes somewhat more quiet than usual, but they keep clicking from the very beginning until the end. Other than this, nothing happens inside the room, even though traces of adjacent appartments (such as, slightly humorously, the flushing of a toilet) can be heard in intermittend intervals. Against all accomplishments of modern technology, the "natural" hissing of the recorder is left in place, remaining in the background as a stable ambiance, yet always morphing. And that is all there is: The rhythm devices click and the hissing quietly swooshes away for sixtytwo minutes, until the first side of the tape ends. Then Rowenta flips it (and the listener changes to the second disc of this set) and another session of the same length ensues. Can you believe this is something worth listening to? I’ll readily admit I had my doubts at first. But they were quickly erradicated. Recording rooms is hardly an idea which came out of the blue. Only shortly ago, Mathias Delplanque published "Ma chambre quand je n’y suis pas" on Angle Records, its title (it means "My room, when I’m not in it").an almost exact description of what is happening on "Raumstudien". Even thinking about this is something of a Schrödinger’s cat for music, but these questions will always keep their fascination: What happens once you deduct yourself from the equation? Is there something at all inside a mechanical universe? Can you tape the voide? The difference with Delplanque and Rowenta is that while the former used the sounds his highly sensible microphones picked up as source material for a piece of his own, the latter allows the room to play itself and focus on the spacial dimensions. Instead of zooming in on the microscopic details, he eschews clinical precision in favour of wider, but also warmer qualities. One of the results is what the Gruenrekorder label correctly describes as a sensitisation to the room and the space it takes up. After a while, your mind creates a feeling for the outmost corners of this place and you have a strong feeling that you know where the different and even the faintest of environmental sounds come from and what they are. This adjustment process is a gentle and comforting one, the more the place surrounding you morphes into Rowenta’s, the more you feel secure and strangely "at home". The second effect was maybe not quite planned, but it is the one which lifts this album to greater heights. The metronomic pulsations are so utterly equanimous that your entire body slows down and you enter a zone of extreme calmness and inner silence. Because the information you receive is so scant and reduced, your brain interprets this as a positive sign: There is no danger here, so it can let go. It is the same effect the cracklings of a vinyl groove produce when listened to ad infinitum and the very reason some of the old classical recordings have such a familiar and positive feeling to them: Everything is sized down to the most essential basics and you can can either concentrate on the hardly noticeable changes in places you never regarded as interesting before (such as the hissing, which suddenly takes on plentiful meanings) or drift off and use the room as a space for new and different thoughts. The limited time of the experiment clearly classifies it as a composition, not just a random installation, which is why it was a good choice to leave things at two hours instead of extending them to six or more, as has been suggested. Far from being art for art’s sake, this is a great example of how experimental music of the most extreme kind can work on more than just a cerebral level. And it sounds like nothing out there. 03 Review by Tobias Fischer | tokafi | "Raumstudien # 02"
Talking about "drastic": Frank Rowenta is Gruenrekorder’s current muse in the "Sound Art" department. Head of Jeans Records and a decade-long player in the German experimental underground, Rowenta released the both incredible and improbable "Raumstudien #1" a couple of moths ago, which was "Album of the Month" at tokafi for the sheer absoluteness of its immersive approach: A room, two rhythmic divices, an old tape recorder with equally old tapes and nothing more. In the absence of noise suppression, hiss itself turned into an instrument, the room unfolded within your own space. A comforting and disturbing experience at the same time.